A great way to ignite democratic participation, an antidote to political apathy, and a learning process for all involved - just some of the benefits to using participatory budgeting (PB) advanced at day one of the two day International PB Conference which was held in Edinburgh on the 20th and 21st October 2016. PB is a way for local people to have a direct say in how, and where, public funds can be used to address local requirements. Read more on what PB is here. The first major participatory budgeting (PB) conference of its kind in Scotland was attended by nearly two hundred people from eleven different countries. Participants brought their own examples of PB in practice, explored some of the challenges and opportunities of PB, and heard from international examples through a range of presentations and workshops. Opening the day, Kevin Stewart emphasised that PB is about shifting the balance of power towards citizens, helping to create a Scotland that is fairer and more prosperous. Citing the example of PB in Barra and the Uists where local people have had the opportunity to vote on how to spend the £500,000 public transport budget, the Minister called for more public sector bodies to follow suit and disburse core budgets through participatory processes. He underlined the Scottish Government’s existing support for PB through the £1.5m Community Choices fund, which will see 28 successful statutory, voluntary and community organisations implement PB projects across Scotland in 2017. Our keynote speaker, Pauline Véron provided valuable insights from one of world’s largest PB processes, where €100m per year is being channelled into city-wide and district-based PB initiatives. In 2016, 158,964 voters have selected 200 projects to be funded. Pauline told us that everyone in Paris can vote, regardless of age or nationality, and she was proud that the first city-wide vote prioritised facilities for homeless people and refugees. Interestingly, the Deputy Mayor connected PB to the revolutionary instinct of Parisians, and advocated PB as a way of re-engaging people in democracy. But in order to do this, she continued, PB needs to be properly resourced, civil servants need new skills, IT systems need to be robust and political commitment needs to be strong. Carly and Darren shared their experience as participants in Young Movers for Change Youthbank, which takes a community development approach to support young people who aren’t the usual suspects to develop solutions to issues they have identified. PB methods have been employed so that young people take ownership of a grant making process for programmes which support young people. Carly and Darren described how being involved throughout the process – from generating ideas for projects to making funding decisions, has given them a range of transferable skills and training certificates. 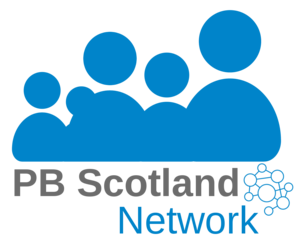 In the afternoon, Oliver Escobar presented the findings from What Works Scotland’s recently-published review of PB in Scotland so far, which highlights that at least £1.75 million has been invested by PB projects in Scotland with no less than 179 individual projects being funded via PB. Oliver welcomed a consistent focus on disadvantage and the wide mix of demographic groups and thematic issues being funded, but noted a lack of rural examples of PB as well as little opportunity for public dialogue and deliberation. He recommended more evaluation be built into future PB, and welcomed the Scottish Government’s funding of a two year evaluation programme by Glasgow Caledonian University of the impact of PB on communities. People attending the conference also got to take part in a range of workshops giving Scottish and international examples of, and perspectives on, PB. Contributors from across the globe highlighted their local initiatives and methods and gave their own thoughts and learning. The workshops were an excellent way to get into proper discussion around the important issues, opportunities and challenges around taking PB forward. Read more, and download workshop presentations, here. After the final round of workshops, Carol was joined by Martin Johnstone, Secretary of the Church of Scotland’s Church & Society Council and Stephen Gallagher, Deputy Director, Scottish Government for a plenary discussion on Scotland’s ambitions for PB. They emphasised the huge appetite in Scotland for recasting the relationship between citizens and government, as well as the growing awareness of PB across Scotland. The plenary also welcomed the engagement of young people in PB, and urged those developing PB to think creatively (one size doesn’t fit all) and to focus on making things fun while maintaining an ongoing connection and dialogue with communities. PB Scotland would like to give a huge thanks to everyone involved in organising and delivering this highly stimulating conference, including all participants on the day. We will do our best to ensure that the international learning from the day shapes how PB is taken forward in Scotland. By subscribing to PB Scotland mailouts here. Together, we can develop PB in Scotland in a way that works best for everyone. To follow the story of the day as reported on social media, click here. You can also listen to four radio interviews made over the two-day conference with Jez Hall from the UK Participatory Budgeting (PB) Network, Alastair Kennedy from Elgin, Kathleen Glazik, a civil servant in the Scottish Government, and Giovanni Allegretti, an academic and international expert on Participatory Budgeting (PB). The interviews were conducted as part of a special edition of the Davy Jones politics show on RadioFreeBrighton.